I’ve had Battle Cat for awhile now. 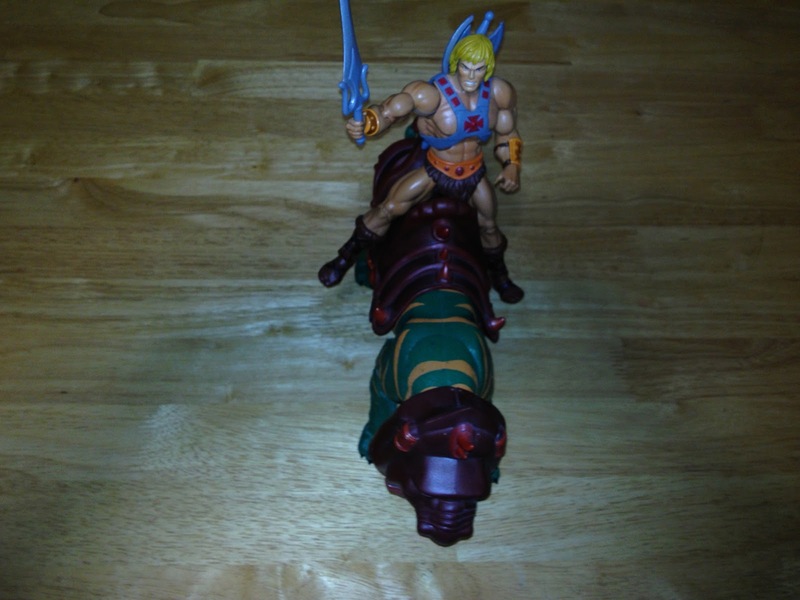 I play with it about as much as I do He-Man from the same toyline. Which is to say, not much. He is more of a display piece. It is fun to set him on the table while playing Magic cards, however. Maybe add a further fantasy element to the whole thing. So here’s what I think after all this time. Battle Cat is HUGE. The regular figure size is closer to 7 inches. So Battle Cat, who is classified as a “beast” is scaled to look right with a 7 incher sitting on him. Let me just say. This figure is OVER THE TOP! The sculpt is marvelous. The articulation is good. and I mean, WOW. Mattel and the Four Horsemen really did this thing right! Battle Cat probably weighs about a pound. He came in a “window box” package. And since I just usually throw that part away, I don’t have any pictures. I guess I’ll start with him naked. Lot’s of articulation to explore. Is it cold in here? Or is it just you? His jaws move. His head turns, apart from his neck. His neck moves up and down. He has “torso” articulation in the middle. His tail moves on a ball joint, so you can pose it any way you want. His shoulder and hips move back and forth. His back legs have knee joints (hinge style), his elbows have a ball joint. He has two shin pieces on the back legs. And his feet are on ball joints, that also have a hinge. Needless to say, you can pose Battle Cat any way you want just about! 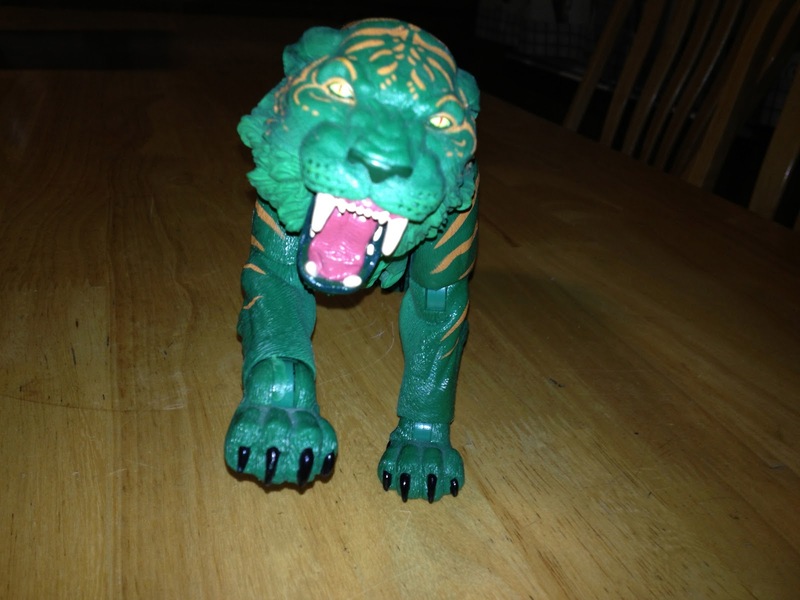 Unfortunately, the naked Battle Cat still doesn’t look like cringer. He’s too serious and menacing, with those big teeth and that angry look in his eyes. So, do I have any gripes. I mean, it took me awhile to figure out the correct way to put on the armor. I think it looks better the way it is supposed to be, but at first I was trying hard to make it look like the vintage. And here is my second complaint. Battle Cat is a weakling! seriously! The helmet weighs enough to make his head droop. 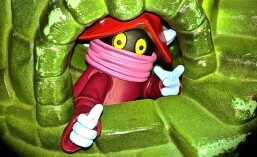 In fact, it droops without the helmet on. That neck joint is kinda loose. There are two little “stirrups” on both sides of the armor. I call them stirrups because that is what they are. But Mattel tried to play them off and say that they were places to put extra weapons. That’s a load of BS. Kind of like the reversed forearms on Stinkor being a design choice. I smell a rat skunk. 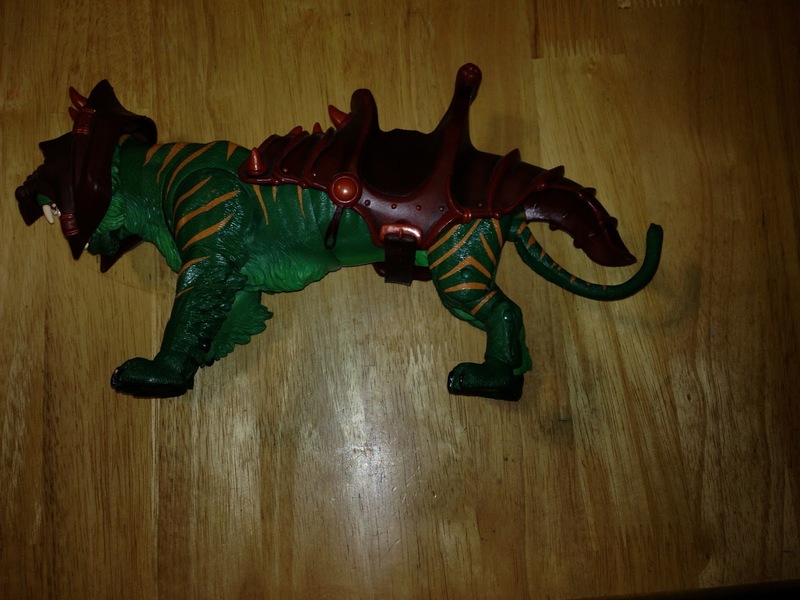 This entry was posted in Battle Cat, Four Horsemen, He-Man, Masters of the Universe Classics, Mattel, MOTUC, Ravens, review, toy. Bookmark the permalink.